Annnd we made it! In a week that felt like there were two Mondays, I am so ready for the weekend. Don't get me wrong, I certainly squeezed some fun out of this week, and have been rocking my red, white & blue for most of it! 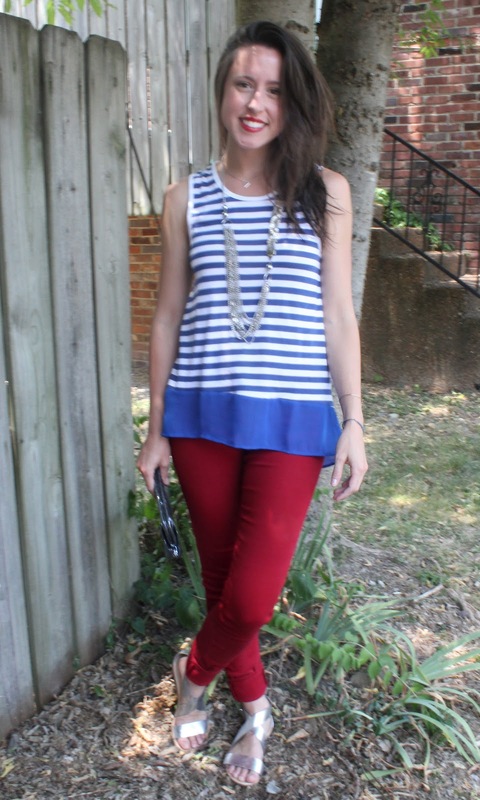 Today, I am linking up with Friday's Fancies over on Long Distance Loving to go out with a bang on my week of patriotic theme dressing. In the adult world, dressing up for themes doesn't get to happen very often, but I am one who jumps on the opportunity every time it is deemed socially acceptable, and sometimes when it isn't! Did you go all out in stars & stripes, or class it up in a fun frock? jessica you look so pretty! you look fabulous in red white and blue! happy friday, girl! love the shape of this tank - the bottom is really neat. and your red pants are adorable. i do enjoy my theme dressing too! what a cute outfit!! love the back of the shirt! That tank is really cute...I love the little ruffle on the bottom! TGIF...have a great weekend, Jessica! You look really pretty :) I love the red white a blue outfits! Love all the bright colors!! Have a fun weekend! great sandals and striped top!! love the color combination with the pants!! This top is sooo cute! So cute! 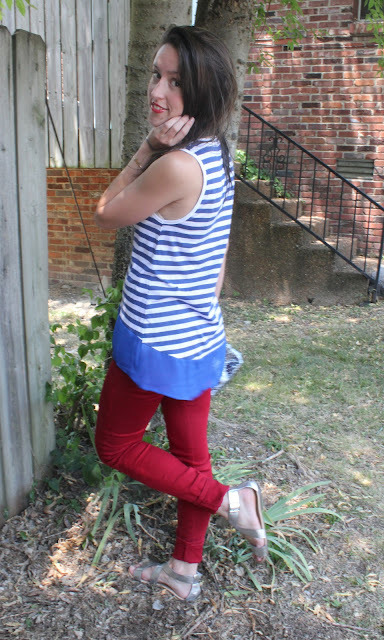 I love your red, white, and blue outfit! Love those Gap leggings- great color of red. I was a home body on the 4th, but I still rocked the red, white, and blue. Like you said, we don't get these chances in the real world! I Was SO close to ordering this tank and now that I'm seeing it all over you I'm regretting not pulling the trigger! Super cute. This is literally the best 'merica outfit ever. You're looking so chic! That peplum top is the bomb. I LOVE dressing up for holidays! I think it's so fun! Love this look and love that lip color! Gorgeous! Hope you had a great day! Such a cute top Jess! You look beautiful, hope you have a fabulous weekend! 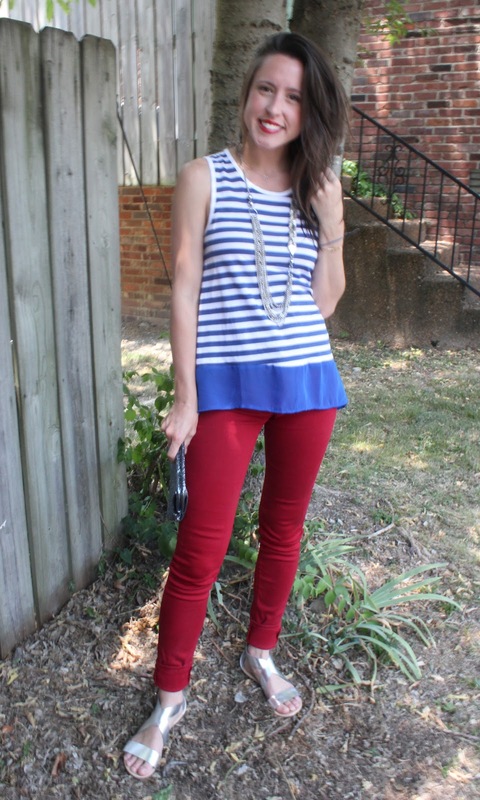 Love those Jeggings and necklace! Great outfit! 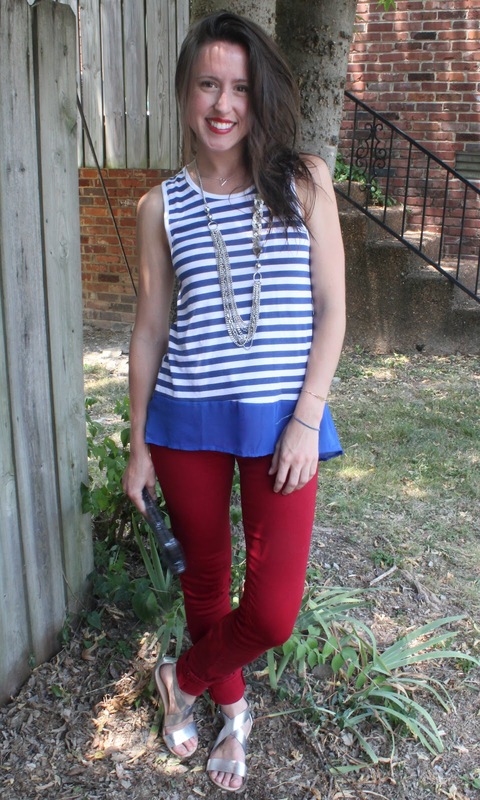 Love your 4th look! Such a fun top! 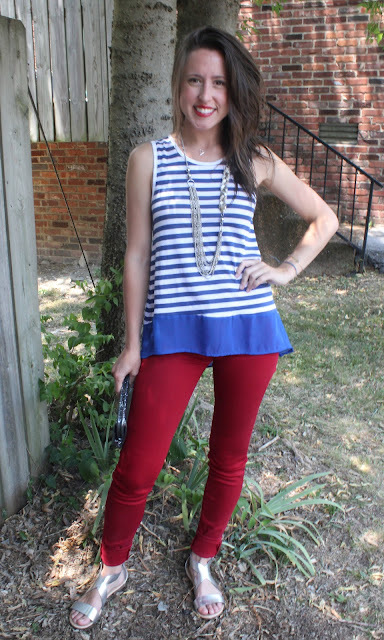 love your red skinnies paired w/that striped top!